"Where the dogs are steamed, and the burgers are square!" Located in the Prairie Trail Center, Tony's Steamers is the 'go to' for Chicago's finest in food tradition. At Tony's, the dogs are steamed and the burgers are square! Since 1981, Tony's Steamers has been serving a variety of sandwiches, including the signature hot dogs and cheese dogs, charbroiled hamburgers, subs and chicken. 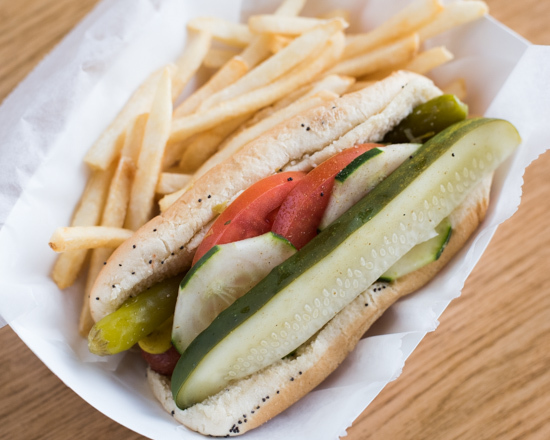 Tony's Chicago-style hot dogs come loaded with freshly cut fixings. We steam the Vienna Beef hot dogs instead of grilling or frying, maintaining the authentic flavor of each dog!. Tony's Steamers has partnered with UBER EATS and DoorDash to bring the Hot Dogs to you! Simply download the app on your mobile device, and order delivery today! Need to skip the line? Now order your favorite sandwiches from the convenience of your mobile app or computer, and grab your order at the pick-up counter! Ground fresh daily by the Wheaton Meat Company.